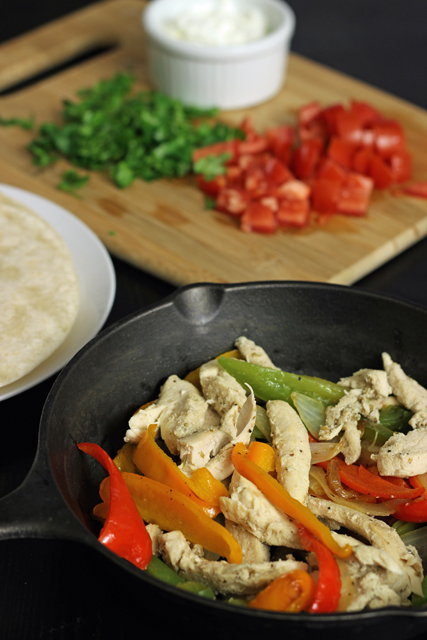 Pull dinner together in a jiffy with this recipe for Easy Chicken Fajitas. Slices of chicken, onion, and pepper are simply seasoned with cumin, oregano, and garlic for a quick-fix dinner. When I was a kid, fajitas were merely restaurant fare. If you were lucky to get to go to Don Cuco’s or El Torito and your parents let you order for yourself, sizzling fajitas were delivered to your place. Slices of chicken, onion, and bell pepper piping hot and a foil wrapped packet of tortillas on the side. It was pretty sweet. As a teenager, my friends, Jen, Sam, Stephanie, and Kelly, and I explored all kinds of yummy food, either together or vicariously. Oh yes, there was the time when we went to El Torito and Jen told the waiter my name was Mable and that it was my birthday. Nice. I don’t think I’ve ever eaten fried ice cream with such guilt. We made pita sandwiches with ham and cheese and packed them for lunch to save money. We shared our dinner cooking exploits at school the next day. Kelly’s dad made guacamole out of peas! Sam’s mom bought them all kinds of bagged chips and cookies which I envied. Stephanie’s parents made great nachos. I have this very clear memory of Jennifer telling us how to make fajitas in PE class when we were probably supposed to run laps. Jen and fajitas will always be linked in my memory. These fajitas are a little different than the ones I learned to make back then. I no longer use a package of Fajita Seasoning, instead using my own custom blend from the spice cupboard. And these don’t sizzle quite as hot as those from El Torito, but that’s okay. I like not flaying my skin. 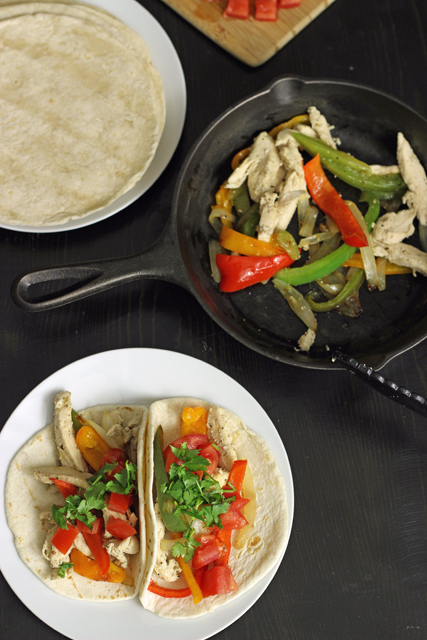 These fajitas, though, are easy to make and super delicious. My kids gobble them down in no time. Made from a few simple ingredients, they come together quickly — in less than 30 minutes! You could very easily serve the fajita mixture on a Mexican food buffet, offering different types and sizes of tortillas as well as rice, beans, and your regular taco toppings, like sour cream, salsa, cheese, tomatoes, and lettuce. If you have leftovers, they’ll go great in a burrito or atop a salad, but I’m skeptical that there will be leftovers. We prefer buying the frozen chicken tenders at Trader Joes. I’ve become very spoiled by this very convenient bag of chicken. The meat never gets tough or too chewy. It’s delicious! In a large nonstick skillet, heat the oil until shimmering. Add the onion and sauté for five minutes. Add the peppers to the pan and cook for another 5 to 7 minutes until the vegetables are tender. Season to taste with salt and pepper. Remove the vegetables to a dish and cover to keep warm. Add the chicken to the skillet and season with the cumin, garlic, powder, and oregano. Cook until done, tossing frequently, about 5 minutes. Add the vegetables back to the pan. Adjust the seasonings and serve with tortillas and toppings. I have started putting my meat, veggies, & seasonings in the crockpot. a little prep & it does the rest. my seasonings are pretty simple also & basically the same as yours. we have done chicken & steak & both delish. 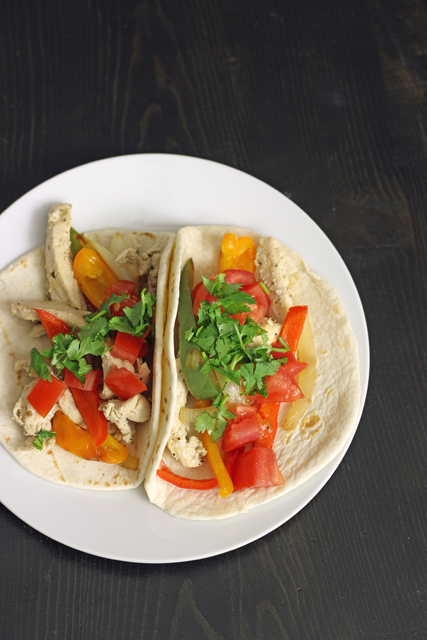 How do you like the texture of chicken in the crockpot for fajitas? I’ve thought it was dry? This is a huge hit at my house! I marinate the chicken for several hours and my husband grills it. Yum! We usually have guacamole or black bean salsa with it but lately I’ve been making Avocado Salsa Verde…..AMAZING! I make this in the crock-pot and it is not dry, the only other thing I add is lime juice – maybe that helps with moisture. Smells divine all day!